As we reported earlier, BSNL revised it's Prepaid WiFi Plans on PAN India basis and launched one new BSNL Free WiFi plan on 15th April 2015. Now, BSNL has decided to increase the Free Usage limit of the newly launched BSNL Free WiFi plan to 30 Minutes in a day from the existing 20 Minutes on PAN India basis. The free usage can be availed by a customer for maximum three times in a month. 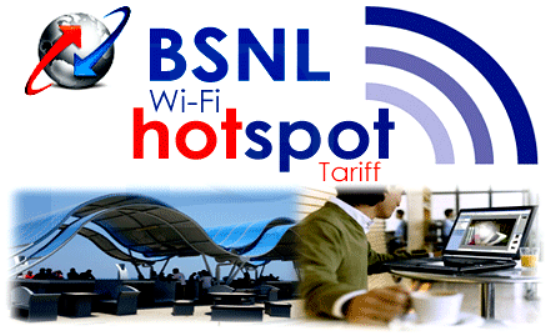 BSNL offers Free WiFi services to customers of all mobile users. BSNL started offering 4G level Free WiFi services at major Ghats of Varanasi and other locations in India in association with US based Quadgen Wireless Solutions Pvt Ltd.
BSNL is already in process of rolling out its WiFi hotspots at major locations across the country as part of Digital India Project. BSNL's new CMD Sri Anupam Srivastava has already declared that it will be investing Rs 7000 crore in setting up integrated 3G, 4G and WiFi hotspots across the country over the next 3 years. Dear readers, please share your views and opinions about BSNL Free WiFi Services via comments with us.